GE Fanuc Intelligent Platforms , a unit of GE Enterprise Solutions, has announced that its QuickPanel View products have been enhanced to allow greater integrated communications with a vast array of products through collaboration with Kepware Technologies’ KEPServerEX. 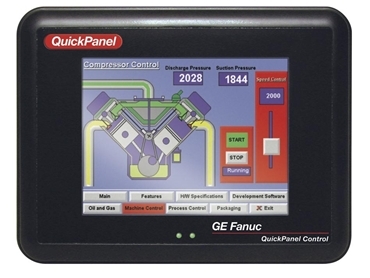 “By using Kepware Technologies’ software, we added 39 new third-party protocols to the QuickPanel View platform and will add 97 protocols for View Runtime on the PC platform,” said Paul Daugherty, Operator Interface Product Manager for GE Fanuc Intelligent Platforms. A joint development team from Kepware Technologies and GE Fanuc Intelligent Platforms worked to integrate KEPServerEX and drivers into GE Fanuc Intelligent Platforms’ Proficy Machine Edition View software. This integration means that users can add drivers, devices and tags just as they did before. Tag Variables are created once and once only. Integration provides consistency in configuration from driver to driver and access to in-depth diagnostics for troubleshooting. QuickPanel View drivers are included in the Machine Edition View Development package. Available in a variety of display sizes, the QuickPanel View bundled visualisation solution provides the tools required for today’s application needs. By integrating the QuickPanel family of touch screens with Proficy Machine Edition software, QuickPanel View delivers flexible, scalable performance on a rugged hardware platform. The intuitive environment of Proficy View – Machine Edition software helps reduce application development time, and connectivity is made easy with a family of serial, Ethernet and fieldbus interfaces. “GE Fanuc is a leading vendor in the HMI/SCADA and HMI Panel marketplaces and we are excited to have been selected as a supplier of communications technology,” said Roy Kok, Vice President of Marketing and Sales for Kepware Technologies, located in Portland, Maine.